This post will remain at the top until 9/30/15. Please scroll down for the new daily posts. Really Reasonable Ribbon is doing a full design team call and we are looking for 2 or 3 new members to join our highly creative team. We are looking for talented crafters and artists who love using ribbon, work well with deadlines and have great personalities. If you are a card maker, scrapbooker, hair bow maker, paper crafter, ribbon artist, altered artist or if you do anything fun and unique with ribbon please apply. Our readers are looking for variety, so don't be afraid to show your creative side. Unusual and creative projects are encouraged. For the complete information, please click HERE. Hello, all our ribbon-loving friends! We're so glad that you've stopped by today for a little bit of ribbony inspiration. Karen Letchworth is really hoping that her shabby cards will motivate all of YOU to pull out some old patterned papers and make a card that's dripping in ribbon and flowers. With the help of Really Reasonable Ribbon, you're SURE to end up with something beautiful. Here's what I did with some older papers and embellishments I had on hand. 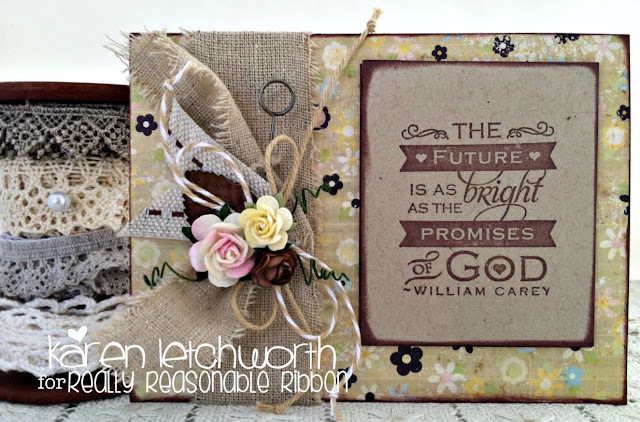 Really Reasonable Ribbon's amazing ribbons, trims and flowers made these cards SHINE! To be perfectly honest, the card itself is nothing special. It's a piece of paper that's been inked, and has a stamped sentiment on a piece of kraft paper. Honestly, that's IT! The rest of that cuteness is ALL 100% Really Reasonable Ribbon. First, I ran a length of the GORGEOUS shabby Natural Burlap Trim that I ripped into strips up the left side of my card. Next, I added small lengths/bows of Burlap Center Stitch Brown, Wheat Stripe Baker's Twine, and Solid Wheat Twine. On top of all those gorgeous trims, I added some sweet Really Reasonable Ribbon leaves and flowers including a Brown Mulberry Leave, a Two-Tone Yellow Open Rose, a Chocolate Brown Open Rose, and an Ivory/Pale Pink Open Rose. They're so pretty together, and compliment each other so nicely. My second card uses the same patterned papers, a chipboard frame, and some machine stitching. 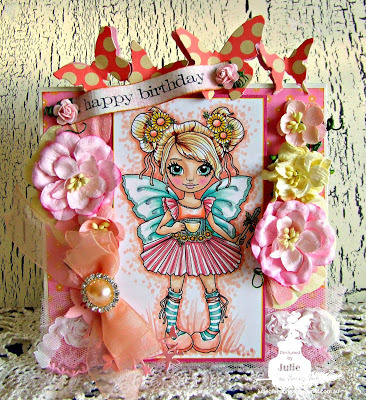 Again, nothing special.....until you add the AMAZING products from Really Reasonable Ribbon. They're truly what makes my cards so much fun. 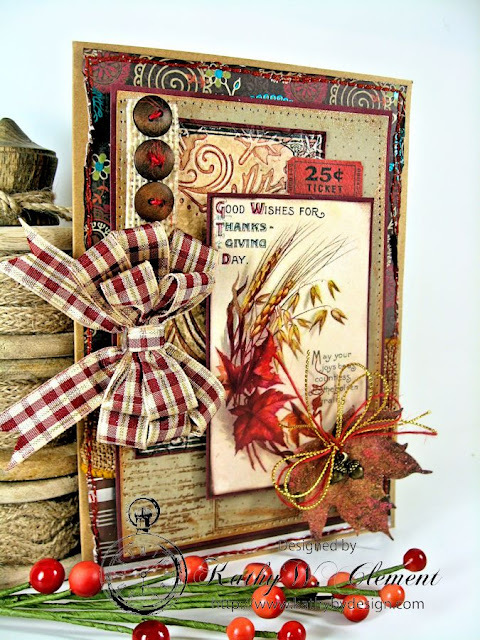 I used the same trims and embellishments on this card, including the Wheat Stripe Baker's Twine, and Solid Wheat Twine. I also added another Brown Leaf and some more flowers including a Brown Mulberry Leave, a Two-Tone Yellow Open Rose, a Chocolate Brown Open Rose, and two Ivory/Pale Pink Open Rose. They're just SO sweet, and they really make your cards become something special. I encourage you all to treat yourselves to some new ribbons, trims, laces, twines, leaves, flowers and more from Really Reasonable Ribbon. I just know that you will LOVE these sweet products as much as I do. And you can take some ordinary papers, and make them into something special. 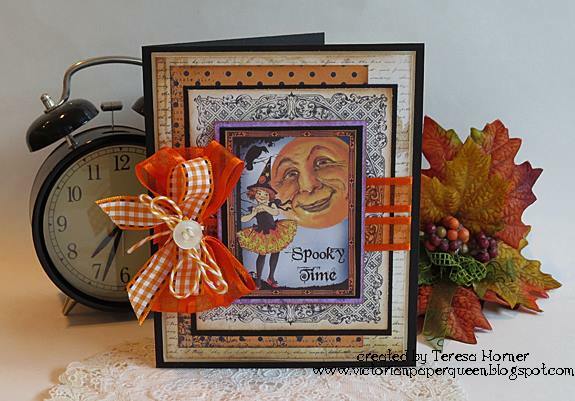 We'd also love to have you stop by and play along in our current Orange/Autumn Challenge. Hi to all the Really Reasonable Ribbon friends and fans. I cannot believe it is the last week of September. I guess I better get busy on the Halloween costumes. 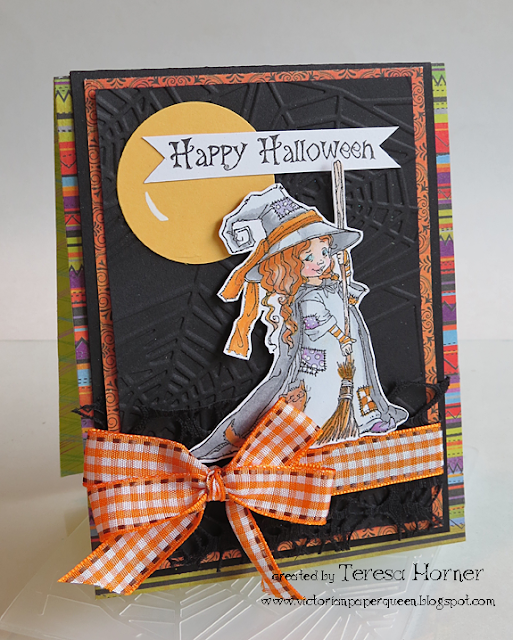 Today I have a super simple card using three different ribbons from RRR. I die cut my butterfly, then I added two strips of micro gingham plaid. It comes in several different colors. Next I added a double bow made with Shimmer Satin in Aqua and red Bakers Twine. I tied a bow with the bakers twine first then without taking it off the Bow It All 2.0, I tied a single loop bow with the shimmer satin. I brought the center all the way around the center of the bakers twine. This secured the two together. 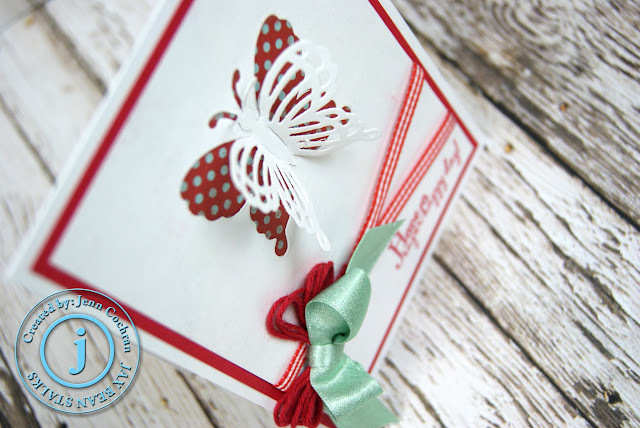 The final touch to this card was adding back the butterfly on top of the patterned paper backing. I popped out the wings to give a 3D effect. Thanks for stopping in! Hope you have a great week. Hi friends. I can't believe September is almost over. I just love Autumn and it seems to fly by every year! I love making projects with rich Autumn colors and it's never done without a beautiful bow using ribbons from Really Reasonable Ribbon! The pretty bi-color double-loop bow is made using Maize Checkerboard Satin Ribbon and Tangerine Delicate Stitched Satin Ribbon on my Bow-it-All V2.0. To see a tutorial on how I created this bow, please visit my YouTube Channel HERE. I made the pretty paper flowers using the Shasta Daisy Die from Cheery Lynn Designs. I love making my own flowers because I can create them in the perfect color to match my project. BUT, if you don't have time to create your own flowers, Really Reasonable Ribbon carries a large variety of Mulberry Flowers from Wild Orchid Crafts that work really well too. Thanks so much for stopping by today. 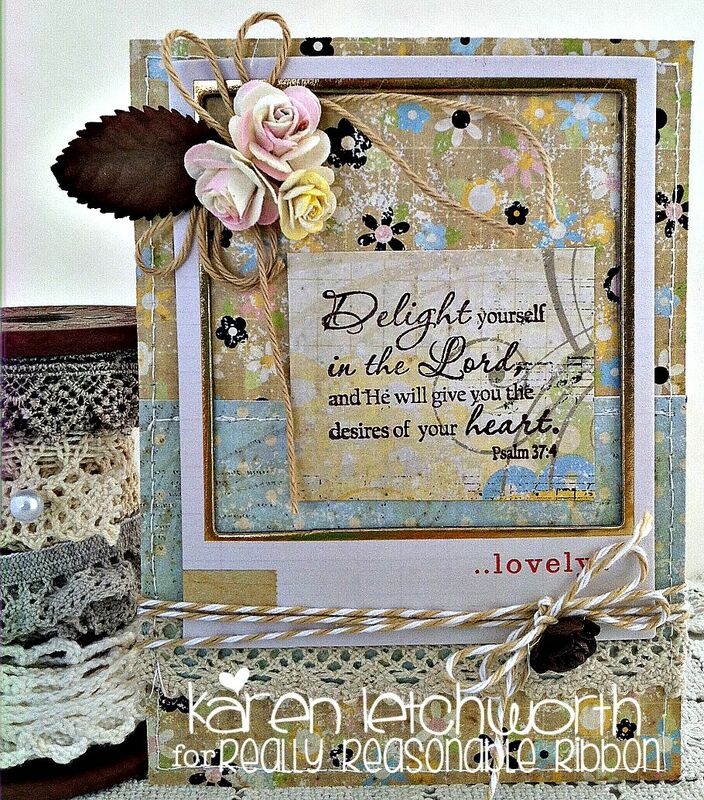 For information on other supplies used on my card, please visit my Make Time to Craft Blog for the full supply list. It's Sunday and almost the end of the month and that means it's getting closer to Halloween time around the globe. This month our amazing "Halloween Ribbon Club Assortment" has been so much fun to use and is perfect for all those fun little projects that you are going to do to dress up the house. Today I have a few today to share with you. My first project is a card I did using a spider web embossing folder, Penny Black Stamp, We R Black Widow 6x6 papers and my favorite check ribbon ever from the Ribbon Club Assortment. 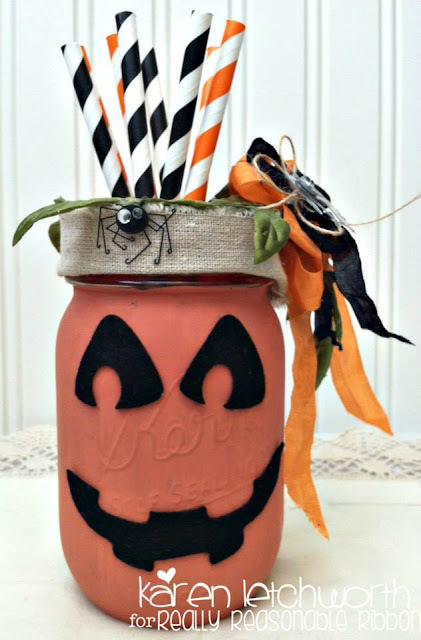 I also used just a bit of this neat "black webbing ribbon" that looks like Spider webs and is great for little things. And of course I had to come up with a new air freshener wrap and this time I used some spider web paper from K & Company and then decorated it with the black webbing and some purple nite seam binding ribbon and a cute bow with the "satin swiss mini dot apple green ribbon". I so love all these colors together. I also thought it would be fun to make some post it wraps to give. For these I just cut paper strips and layered them and then used a Spellbinders die to cut a fun edge on them. To finish it I added a velcro tab to close it and a pretty sheer orange satin ribbon bow on the top. They are fun and festive and it's always fun to give a little something to friends and co workers. I don't know what is happening in your part of the world, but here in North Carolina, Mother Nature is tinting our leaves with gorgeous shades of red, rust and gold. 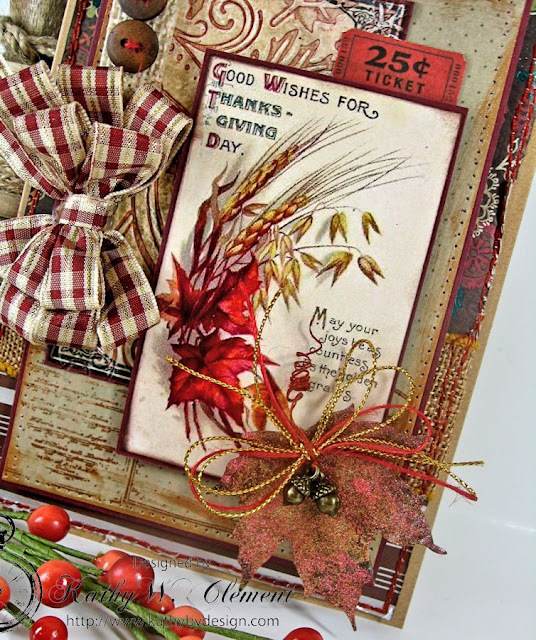 To play upon this color palette, I pulled out my Ivory, Rust and Gold Plaid Ribbon and made a Vintage Thanksgiving card to share with you here today. 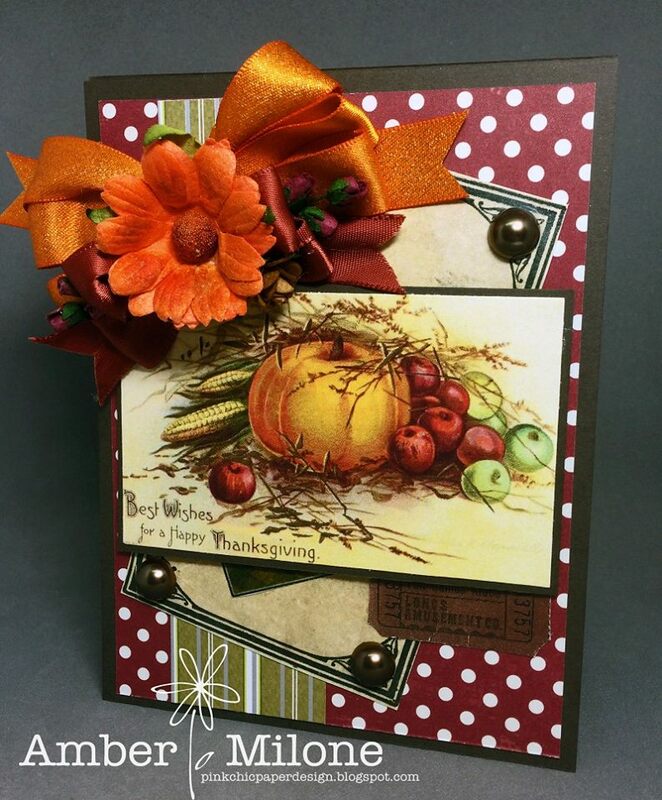 This ribbon was the perfect match for the vintage images in Polly's Paper Fall Harvest Creativity Kit. It really pulls out the red tones in the focal and patterned papers. The tiny touch of gold thread in this beautiful ribbon adds wonderful shine, too. I will let you in on one of my favorite "cheater" techniques here. See the pierced paper layer beneath the focal? You can do this in a matter of seconds by running it through your sewing machine without using thread! The piercing is perfectly spaced and consistent and it takes a fraction of the time if done by hand with a piercing tool. This double layer bow is so easy to tie when you have a Zutter Bow-it-All Tool. There are three loops on the bottom layer and two on top. And, this ribbon ties like a dream. Can you see the belly band I made with Antique Gold Faux Burlap Wired Ribbon? The texture adds a real rustic feel to the card. I wanted to give you a close up look at the metal leaf embellishment and explain to you how I put this great embellishment together. I started with a rusted maple leaf and used pliers to bend the tips and round it out a little in the middle so it wasn't completely flat. Next, I tapped the surface with Viva Decor 3-D Stamp paints. (Copper, Gold and Carmine Red). I love the way these colors blended and the soft shimmer they add to the card. Next, I took 2 lengths of gold metallic thread and one length of red burlap string and tied a single loop bow with my Bow-it-All tool. I used ordinary sewing thread to tie the two acorn charms onto the center of the bow, but instead of cutting the thread short, I left it long, dampened it lightly with a mixture of water and liquid glue, then wrapped it around the barrel of a paint brush. If you are patient (I am not) you can leave this to dry. If you are less patient (like me) you can hit it lightly with a heat tool. Then slip it off the barrel of the paint brush and you'll have that lovely viney squiqqly bit of thread to add even more texture and visual interest to your project. I used hot glue to secure the acorns and bow to the maple leaf, and used foam adhesive to secure the maple leaf to the card. 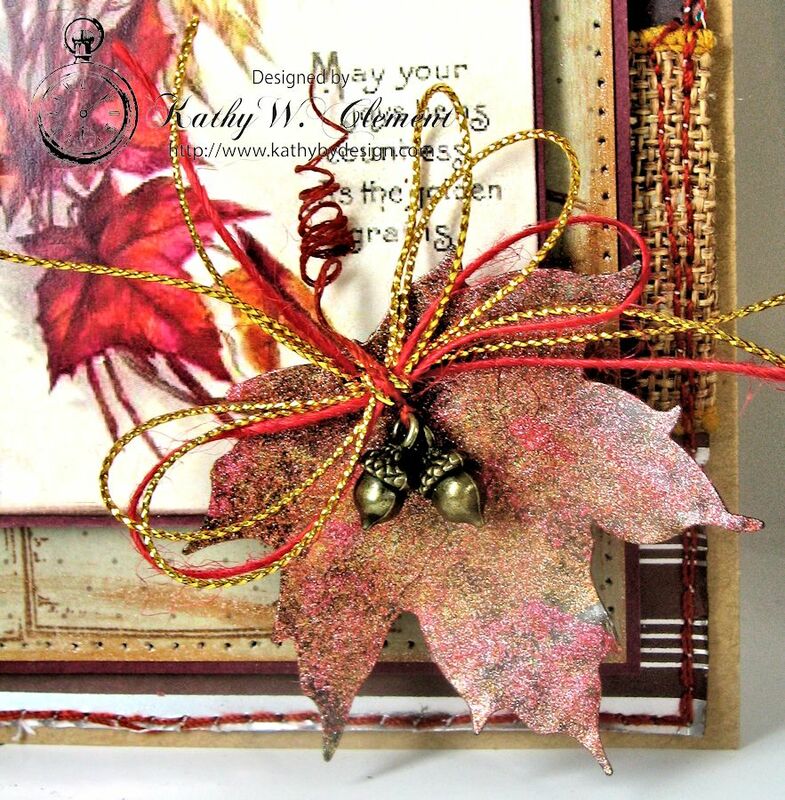 I'm so excited to be working with fall colors, images and ribbons! 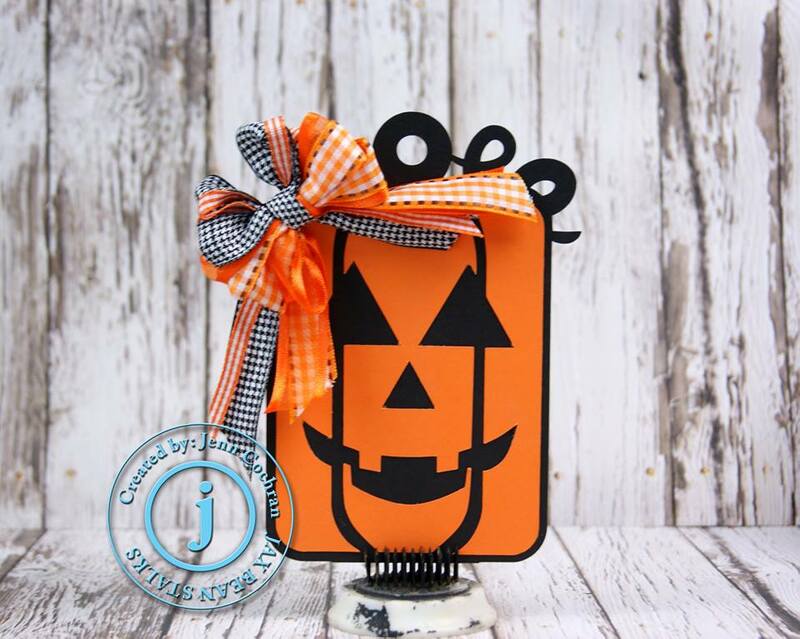 Bonnie has a wonderful selection of Fun for Fall ribbons in the shop, so you might want take a look and see what you can cook up for the upcoming fall holidays. Hi there crafty peeps! 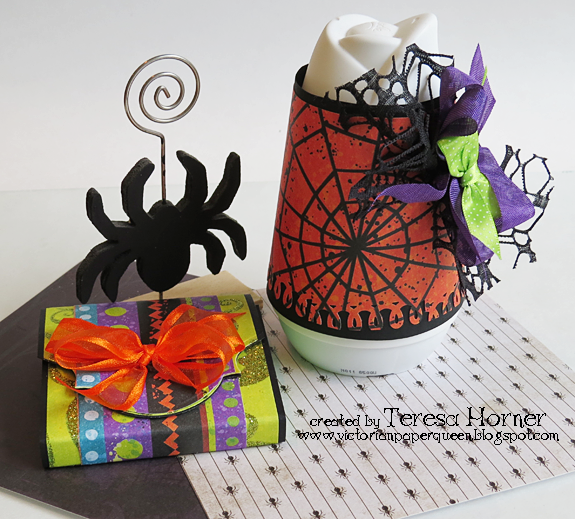 I am back today to share an adorably spooky card I created with adorable Halloween stamps from the Fun Stampers Journey Ghostly Haunts set and two of the ribbons from the September Ribbon Club Assortment. First, I stamped the largest pumpkin onto Copic paper and then masked it off. I then stamped the small pumpkin over the large one, so that when I removed the mask it was behind it. I then masked the large pumpkin again and stamped the large ghost over it, so when the mask was removed it looks like it is floating behind the pumpkin. I then stamped the small Ghost separately. I stamped the funny faces onto each ghost. I colored all of the images with my Copic markers and then fussy cut them out. I cut a rectangle out of Canson Watercolor Cardstock with one of my Cross Stitch Die-Namics. I blended several distress inks onto the cardstock (Chipped Sapphire, Seedless Preserves, Ripe Persimmon, Mustard Seed, Forest Moss, and Black Soot) and sprayed it with a mini mister filled with water. This helped even out and blend the colors even more. I adhered the large ghost and pumpkins down to the dry background. I then popped up the small ghost with foam tape and adhered that next to the large ghost. I die cut a rickety fence in Black Licorice cardstock and adhered that in front of the pumpkins. I heat embossed the sentiment onto the same Black Licorice cardstock with White embossing powder and fussy cut it out. I popped the sentiment up with foam tape and adhered it in the middle of the panel. I then created an A2 sized card base with Black Licorice cardstock and patterned paper from the FSJ Treat Time Prints pack. I then wrapped Black and White Houndstooth Ribbon and Celery Chevron Twill Ribbon around the middle of the card base. I popped the focal panel up with foam tape and adhered it slightly off to the left center of the card base. I then created a quadruple loop bow with my Bow-It-All tool and the same twill ribbon from the band. I adhered that to the middle right side of the card with my hot glue gun. I adhered the entire card to a Whip Cream A2 side folded card. As a final accent I covered both ghosts and the fence with Journey Glaze. I hope you enjoy this cute but spooky card for Halloween. Thanks for joining me today, and make sure to head on over to the Really Reasonable Ribbon store for all of your Halloween and Fall themed ribbons. Have a wonderful day! Hi friends. Today I have a beautiful feminine birthday card to share. I'm still in love with the bi-color double-loop bow and today I'm going purple again. 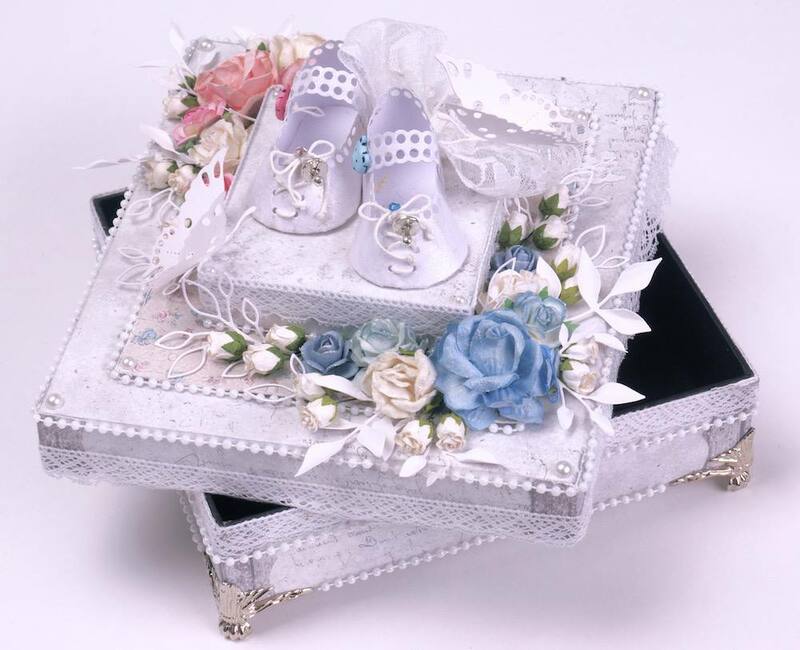 There are so many wonderful ribbon styles and colors at Really Reasonable Ribbon. I won't be happy until I try them all! This beautiful bow was made with Light Orchid and Grape 5/8" Delicate Stitched Satin using my Bow-it-All V2.0. To see a video on how to make this bow, please click HERE. I also ran a piece of the Grape Delicate Stitched Satin across the center of the card under the flower medallion and I topped that with some pretty Paulette Crochet Lace. There really was no way to wrap the ribbon and secure on the back of the panel, so I just dove-tailed the ends. I printed a sheet of my Butterfly Circles Digital Collage, clipped them out and punched a border from black cardstock and layered them up on a printed doily. I found the doilies in the Halloween section at Michael's. I chose a lovely subtly patterned paper and embossed it for texture. Another black border and added that to a card base. 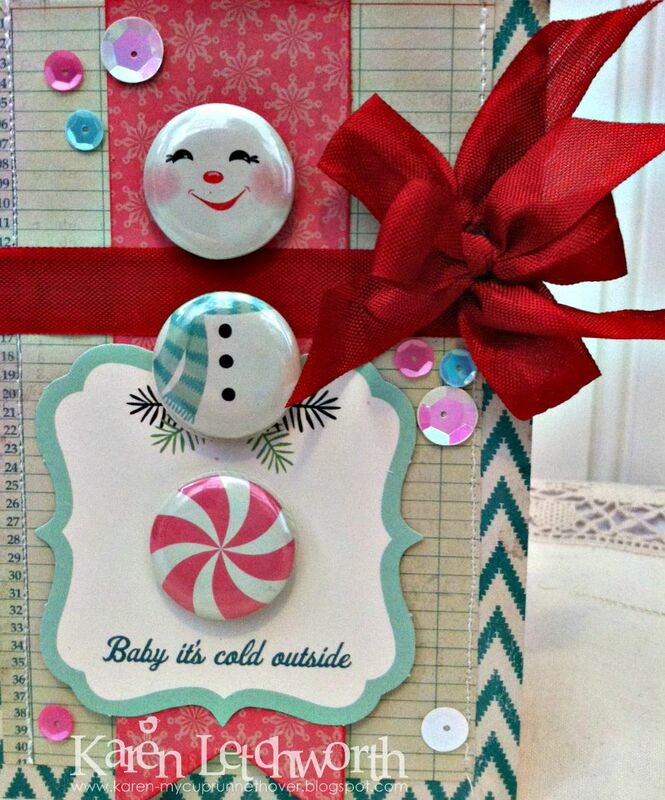 Once I had four cards complete I bundled them up and tied them together with additional ribbon and a metal rimmed mailing tag topped with a fun embellishment and clipped on with wooden clothes pin . Wide Black Plaid Ribbon. Narrow Black Plaid Ribbon. So that's my take on Clean and Simple. Now for my take on add as much stuff as I want style. Beautiful Butterfly Tag. Additional RRR supplies~ Black Burlap String, Turquoise Sweetheart Blossoms. Hello, friends of Really Reasonable Ribbon! We're all SO glad that you've stopped by today. 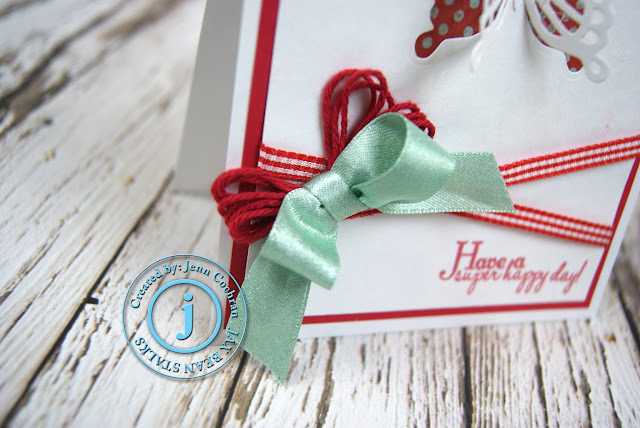 I hope that this card I'm sharing today will get you pumped up for making Christmas cards, and that it will get you ALL to realize that you simply CAN'T live without getting yourself some gorgeous Lipstick Red Seam Binding to help you make all your Christmas cards beautiful! This lovely shade of red is absolutely PERFECT for all your Christmas cards and projects. It's truly a MUST-HAVE supply, and I hope I inspire you all to pick up a few yards for your Christmas crafting. I started with some of my favorite patterned papers and embellishments (papers, flair, journalling spot, etc.) to create the snowman. I added some sweet little sequins to act like snowflakes falling and catch the light. Then.....the best part of ANY card - the BOW! I ran a length of the AWESOME and super useful Lipstick Red Seam Binding across the card, and tied a double bow with it as well. I just love how the red seam binding brings in a Christmas feel even when you use other colors on your card. It's just so festive for the Christmas season, and that's why I consider it a true "MUST-HAVE" for every crafter during the holidays. It's a great time to treat yourself, and this Lipstick Red Seam Binding is a trim that you will find yourself going to over and over again as you create your Christmas cards and projects. I promise that you will love it as much as I do. It's just the sweetest! Really Reasonable Ribbon has so many wonderful ribbons, laces, twines and trims as well as flowers, leaves, and SO much more. Check out all the wonderful items available in their sweet ribbon shop, and treat yourself today. Happy ribbon crafting! I invite you to stop by my blog, My Cup Runneth Over, to say hello and read all about where I got the wonderful inspiration for this sweet card. I always love to give credit where credit is due; and I really enjoy being inspired by other artists. Don't you? I hope you'll stop by! Happy Sunday everyone! So glad the sun is still shining her in Colorado. I was overwhelmed seeing the snow flying in Northern Colorado on Friday! I am totally not ready for Winter. How about all of you? Today I have a sunshine flower for you with a pretty little yellow bow. I have used the Delicate Stitched Satin in yellow for my bow. I tied a double bow using the Bow It All 2.0, also found at RRR. 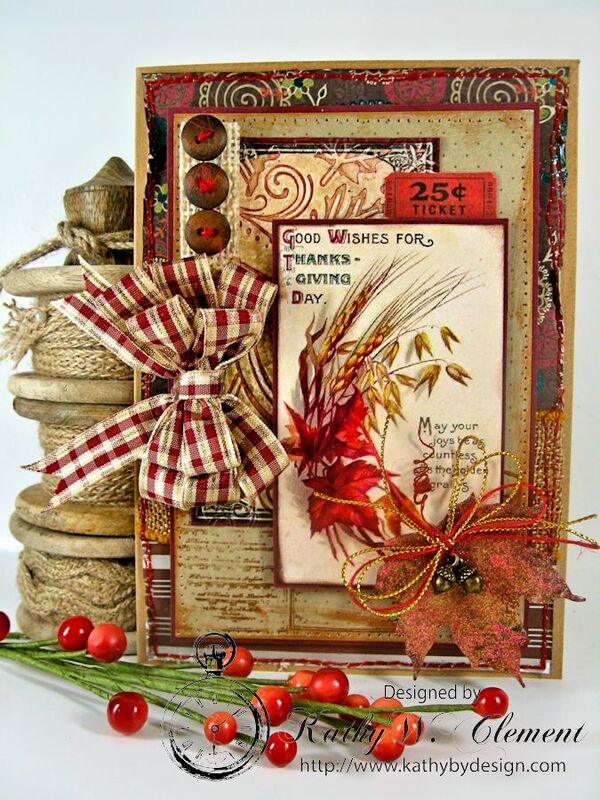 If you LOVE this ribbon like I do, this assortment is a great buy! Hi friends. I'm loving the crisp fall air of autumn along with the beautiful colors. 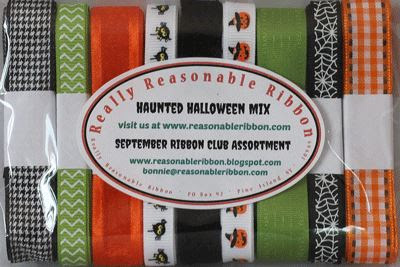 It's hard to choose ribbons I want to work with because there are so many great selections for Autumn and Halloween at Really Reasonable Ribbon. This is another example of a Shabby Bow. I created this bow on the Bow-it-All V2.0 using Brown Silky Crush Ribbon. This ribbon is 1-1/2" wide, but I cut it down the middle to make a 3/4" width. This ribbon does not fray much, but the look is still great for this card. 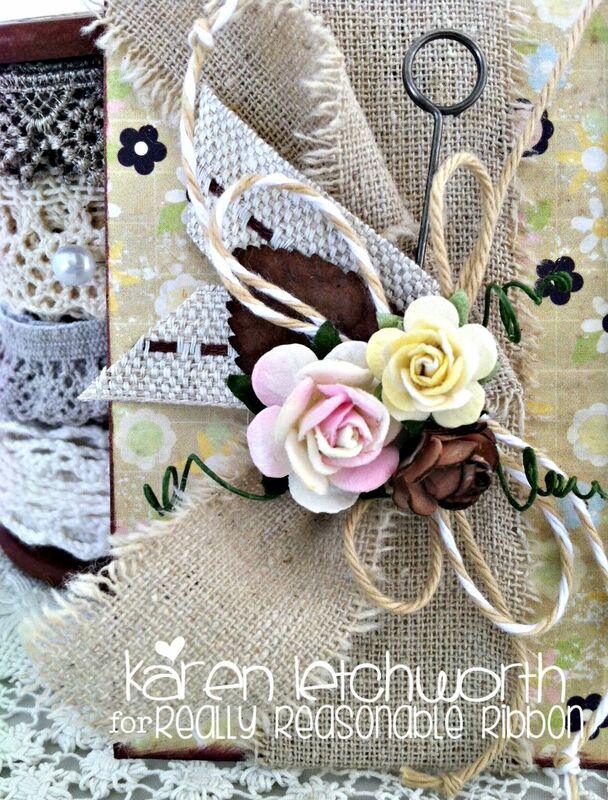 I used the helping hands pegs to hold the Brown Burlap String and then I tied the know of the bow around the string to hold it. You can find the video tutorial for this bow HERE. I also ran a piece of the trimmed down Silky Crush Ribbon through the loops of the tag and topped it with a piece of Turftan/Tan Diagonal Stripe Satin. I love the brown, ginger and green color combination on the card. Thanks so much for stopping by. For more information on the other products I used on this card, please visit my Make Time to Craft Blog. 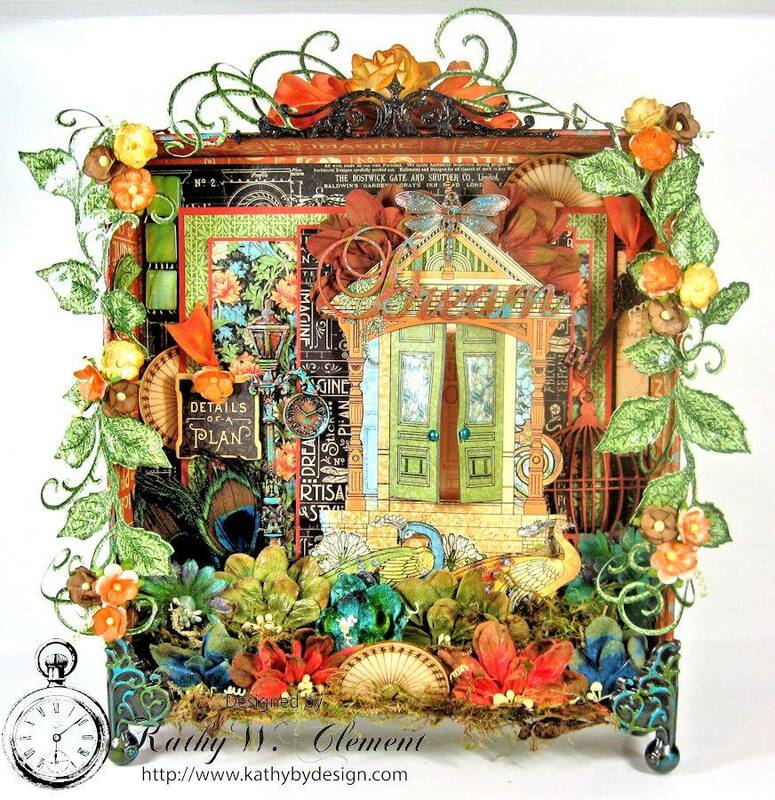 The theme for Challenge #126 is 'ORANGE' You Glad it's Autumn with Ribbon or Trim - (please use orange in your project). Here is a little inspiration from our design team for challenge #126 to get you started. All of the sample projects feature ribbon from Really Reasonable Ribbon. Now, let's see your 'Orange' You Glad it's Autumn creations! We will be selecting our top three favorite projects to feature, so stop back on October 2nd to see our picks along with our next challenge theme. * Post your project on your blog or an online gallery (using code RRR126) and link it here with the Inlinkz tool below. Please provide a direct link to your post, not an entire blog. * You have until September 29th at 11:59 PM Eastern time to enter your projects. Thanks so much for playing and good luck. Challenge #125 was lots of fun with our Things with Wings theme. Thanks again to everyone who played along with us on our Things with Wings themed Challenge. I hope to see you all back again for Challenge #126 which is now up and running.